Hello and thanks for stopping by! Here is another easy homemade ornament idea for you. I used zinc mason jar lids with the porcelain inserts. These are easy to find at most thrift stores and antique shops for $1 or so. If you don't see them ask! Jars break all the time and there may be some of these floating around behind the counter waiting to be turned into treasure. I love the beautiful colors these aged jar lids turn. This lid has not been painted. It is just aged to perfection! I just love this little "elf." The image is from The Graphics Fairy. I'm linking him up to Brag Monday. I used my photo editing software to add the hat and word. These ornaments are easy to make. You will start by using a nail and hammer to create two holes opposite from each other (top/bottom) for your hanger and anything you might want to to dangle. Just a tap with the hammer and your nail will form a small hole. I place a piece of scrap wood underneath while I am doing this. Then, trace the bottom of the jar lid onto your photo, vintage image, etc. Before I cut, I usually mount my image onto chipboard (got a coaster?) then cut. You need a thick base to glue the image to the jar lid. Also, these lids are not perfectly round. So, cut your image, sand the edges (use a nail file) and see if it fits. Trim as necessary. 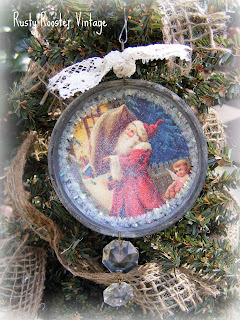 Place a layer of lace or cheesecloth underneath the image to help cover any imperfections in your not so perfect circle. You could also use some vintage pipe cleaner like I did here. I love these zinc lids, they are adorable and I love the images you used. I will definitely try this! Hi, Vicki! These are adorable. The Graphics Fairy is a GREAT site! I haven't been over there in a while! I may have to go visit. Oh, and your Pottery Barn copies are beautiful! What a great idea! I buy these when ever I can. Enjoy your day. You have the best ideas! I love, love, love these ornaments. Gonna have to look for lids!! I love this idea! Perhaps I will try to make a few of my own! Thanks for the inspiration...and also for not thinking I'm crazy! wink wink! These are fabulous...what a clever idea! 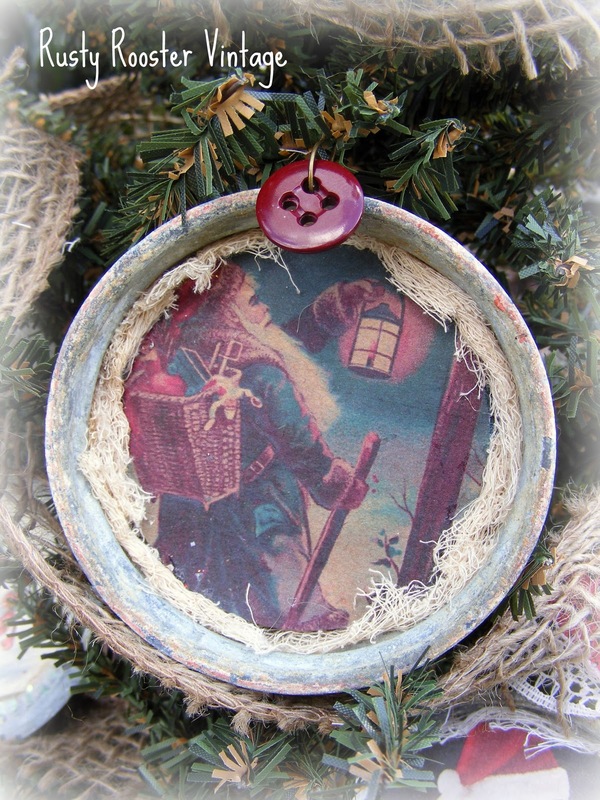 Love your Pottery Barn knock off ornaments too! Very pretty! Those are so adorable!! What a great idea!! Those are so cute! And your husband was so cute back then. Had to laugh when you said pickle jar lid. I was picturing him telling his Mom he needed to take a lid into school and she's emptying the pickle jar from the fridge. Hello! 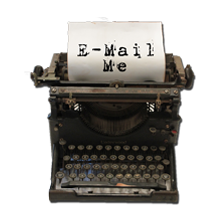 I found your blog through Brenda's "Welcome Wagon." I LOVE the jar top ornaments...I actually have a ton of new lids that I might play around with. I will let you know if I do and link to your blog. Thanks for the idea! Can't wait to read more. I just stopped by from Brenda's Welcome Wagon post. Look at all of the good stuff here and I've barely started. Love these ornaments and the PB ones too. I will definitely be back!! Oh my, you have so many wonderful ideas! I am smitten! Argh! My other post didn't make it. Just wanted to say that I love Oveido and have been twice to the Canterbury Conference Center there years ago. We are up on the First Coast (St. Augustine), so if you are ever up that way, give us a shout. We are right downtown and love to meet fellow bloggers. Speaking of which, a few of us are trying to plan a meeting of Florida bloggers in February at a tea room in Plant City. I did a post about it back in July because we went there for my goddaughter's birthday. We'd love to have you join us if you'd like to. Will probably meet on a Saturday. No date yet. You have so many cute things on your blog. Can't wait to go check out the rest! I am stopping in from Brenda's Cozy Little House. Those are really cute. I love the vintage look of those. One of these days I will learn how to copy stuff from graphics fairy and use photo shop. Don't have a clue. Love this idea, love the adorable pic of your hubby in the pickle jar lid, and love your blog! cute idea vicki! I just met a vendor at Charlotte's metro expo that had these for $.50 each...so I'll have to pick up a few this weekend! You are incredibly talented! I would never be able to make these. What a brilliant idea-I love them! Your creations are just gorgeous.. thanks for sharing!!! Happy Friday everyone! I just wanted to stop by and say hello to friends old and new! Appreciate you taking time out of your day to visit here and leave such sweet comments. Take care! More ornaments this weekend! 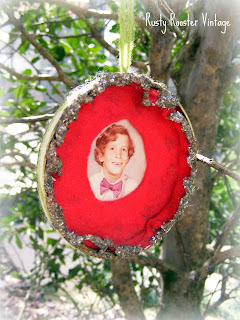 I have one of these beautiful Vicki-made creations proudly hanging on my tree! I love it!! Darn cute idea. Found you thru Brenda's Welcome Wagon Friday, & I'm so glad I did. Looking forward to checking out your other craft ideas. 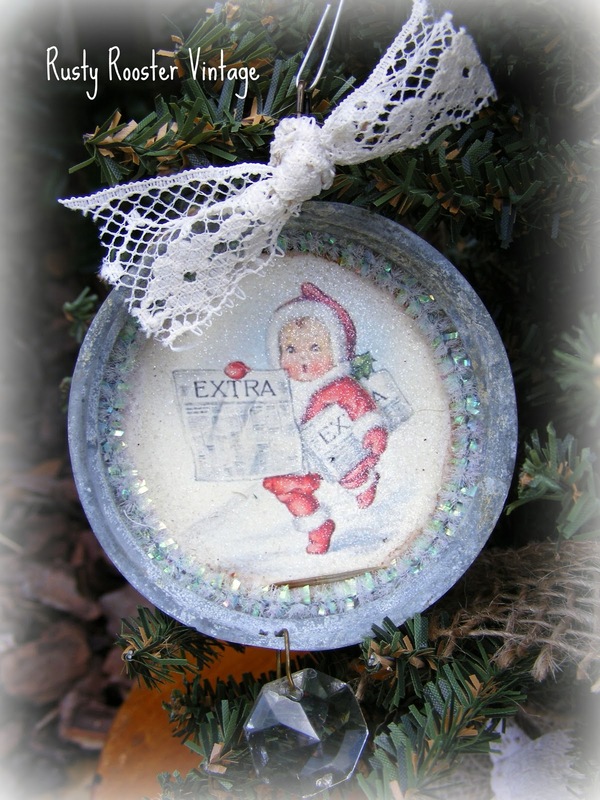 These lids make wonderful ornaments! I love the vintage pictures! Thanks so much for visiting my On the House blog and becoming a follower! 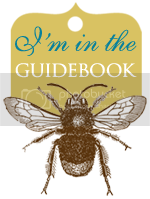 Your blog is lovely, I'm now following! Your mother-in-law surely made a wise decision of giving you your husband's picture. It's really in good, capable hands. Thanks for the idea. 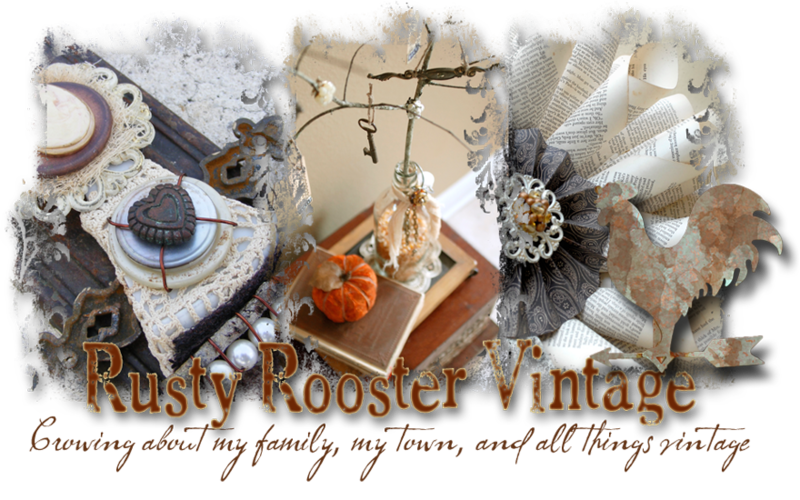 Just hopping by from Vanessa's Inspiration Friday. What a cute idea Vicki. Love it! Thanks for the visit and leaving a sweet comment about my rooster. I really like him in my kithen. I leave all kinds of sweet little notes for my hubby in the morning on it. Hi..I'm bj, over from Brenda's welcome wagon. So glad to meet you. I love your lids..so so cute. Hey, guess what...I already AM a follower..cool. I love this idea! And, I'm like you, I love the patina of these old jar lids! Thanks for stopping by to visit. Have a great weekend! I'm just getting caught up on some blog reading and I love both ornaments that you posted. I have passed up buying some of those zinc lids before because I couldn't wrap my mind around how to use them and now I wish I had them! The ornaments are wonderful and would look great on any tree. Oh my gosh, Vicki, What precious ornaments and wonderful story!!! I love what you wrote on my blog about doing the journals in God's time--that blew me away! I hope you're having a great weekend--and I love these treasures that come from the heart! We lived on Goldenrod just down from University since before Mickey Mouse. Love Oveido! We now live on Amelia Island. I am so excited to see your altered recipe cards. I have so many from my mom's books and I can't bear to throw them away. Now I can use them and make them into something she would have loved. Thank you so much for the inspiration. Great idea and beautiful blog! I'm a follower now. Thanks for sharing! Girl, you have the best ideas! These are wonderful and I love the prism added to the fun! Thanks for linking up with VIF!! This would be such a great idea to do with children too - obviously not to the same beautiful standard!! I'm going to have to start saving up my jar lids!! These are soooo cute! Those zinc lids are s effective. I didn't realize they were readily available at antique stores. I will have to check these out! clever, I just love it! Those are the cutest ever! I am going to have to keep my eyes open for some of those vintage mason lids! These jar lids are adorable! Love all of them and the way to decorated them. I am going to be on the lookout for old jar lids! After looking at your post, I love the look of them! Thanks for sharing! These are adorable!!! What a great idea for those lids! I've got to make some of these. Thanks for the inspiration and for linking this up to Brag Monday. Thank you for sharing to cute! These are so cute and creative! 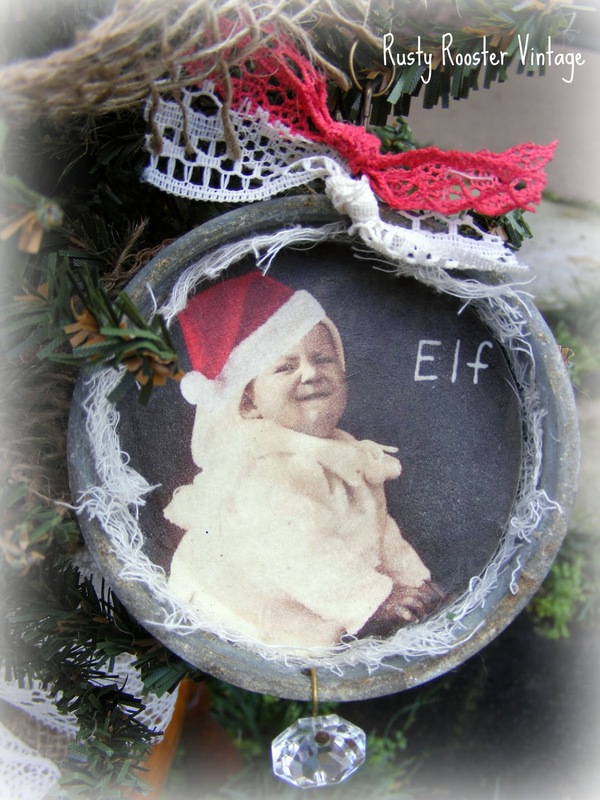 Thanks so much for linking these up to Homemade Christmas, Vicki! Great Day in the Country! 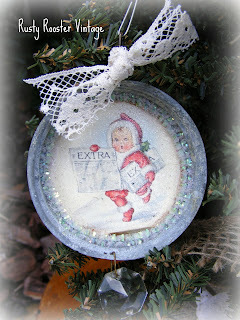 My new ornaments and featured today!